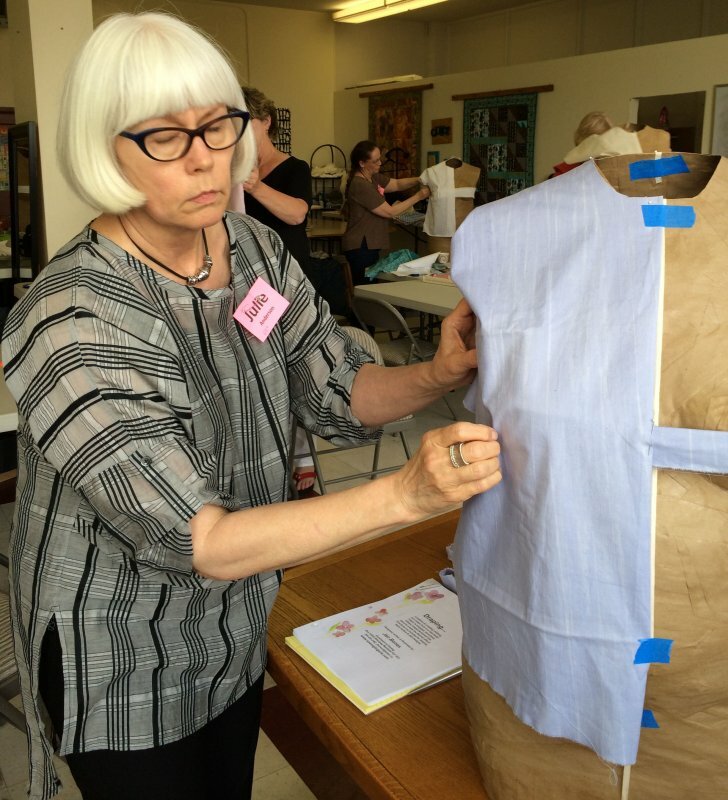 I was a self-taught seamstress…until now. 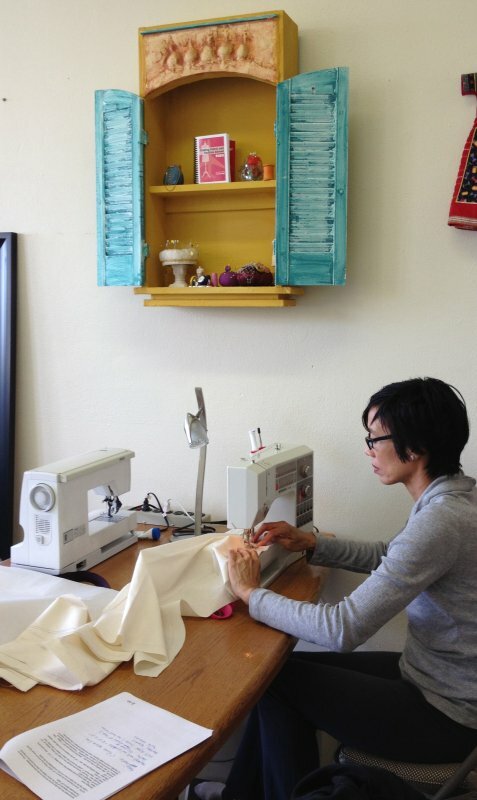 In an effort to improve my skills, I searched Google for “sewing schools” hoping to find something in my area (online classes are great but I wanted access to a real person). 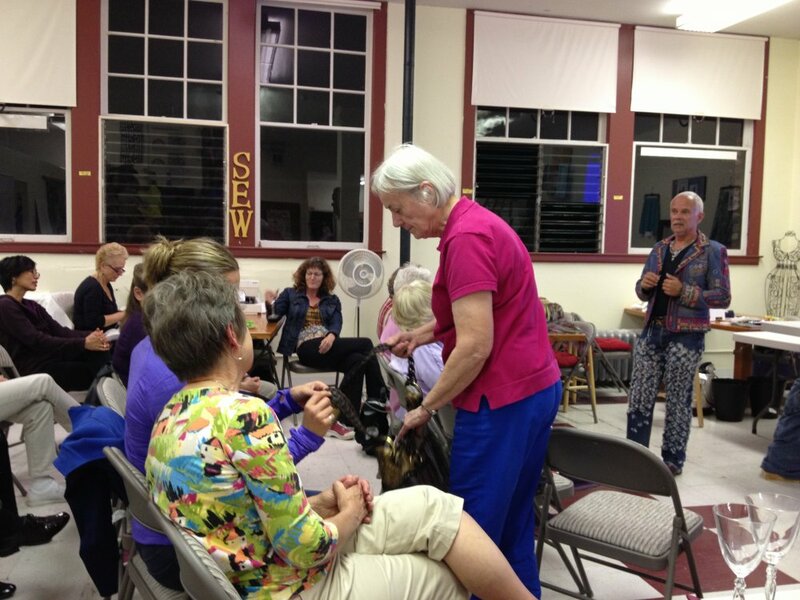 My search revealed nothing close to home so I began to consider the idea of a sewing vacation. 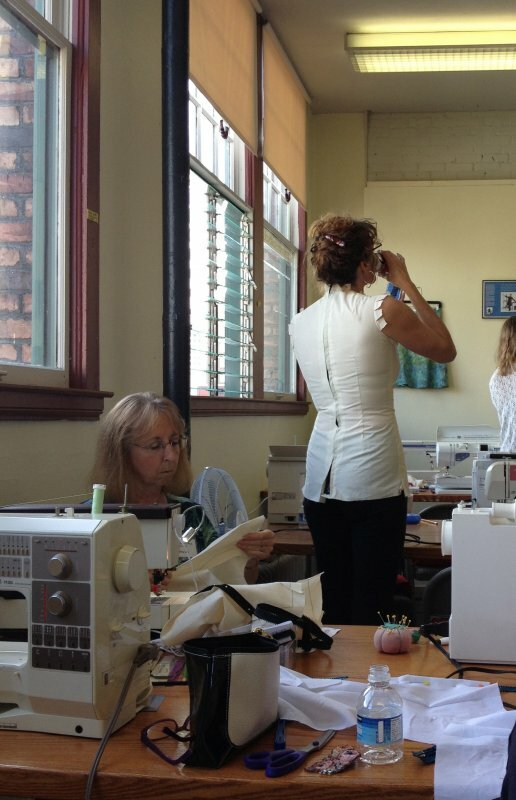 That’s when I stumbled upon The Sewing and Design School in Tacoma, Washington. It didn’t take me long to secure my spot in the moulage class by Kenneth D. King. As a Threads Magazine subscriber, I already knew and respected Kenneth’s expertise. The moulage class was exactly what I needed to reach the next level. 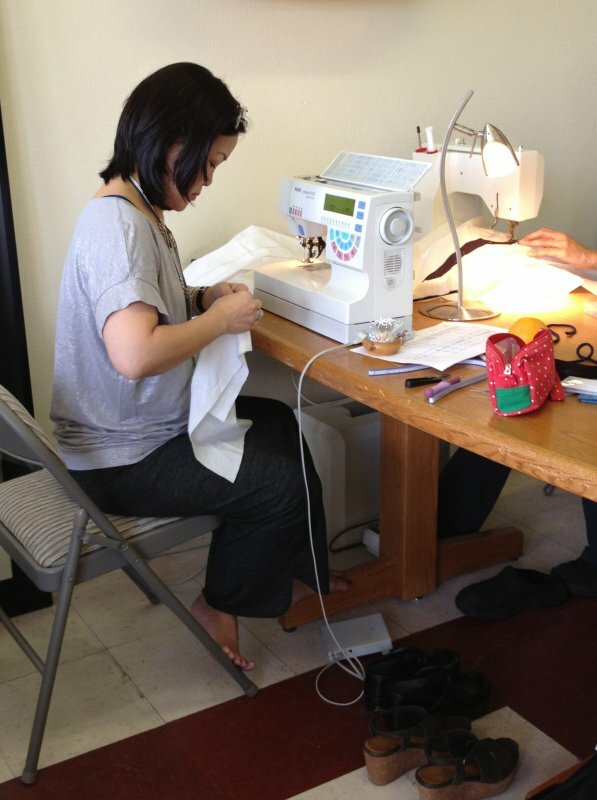 My experience at The Sewing and Design School exceeded my expectations! I highly recommend it to anyone who wishes to take their skills to the next level. Ryliss Bod is the director and she teaches classes too. Find her on instagram @sewing_and_design_school. She made sure everyone had everything they needed for a productive and happy weekend. I enjoyed my time there immensely. Not only did I get to learn from the experts but I also got to see a beautiful part of the country. I sincerely cannot wait to go back. 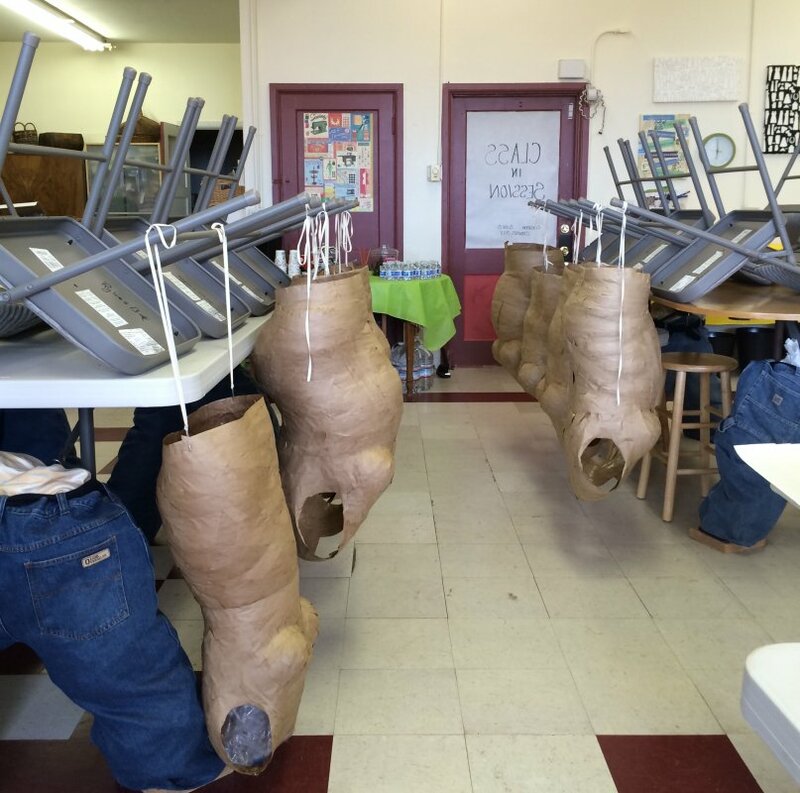 They offer a variety of classes for beginners and advanced sewers alike. You can learn from experts such as Ryliss Bod, Lynda Maynard, and Kenneth King. Check out the class schedule for updates. Thanks so much for doing what you do - offering all the wonderful instruction and knowledge. 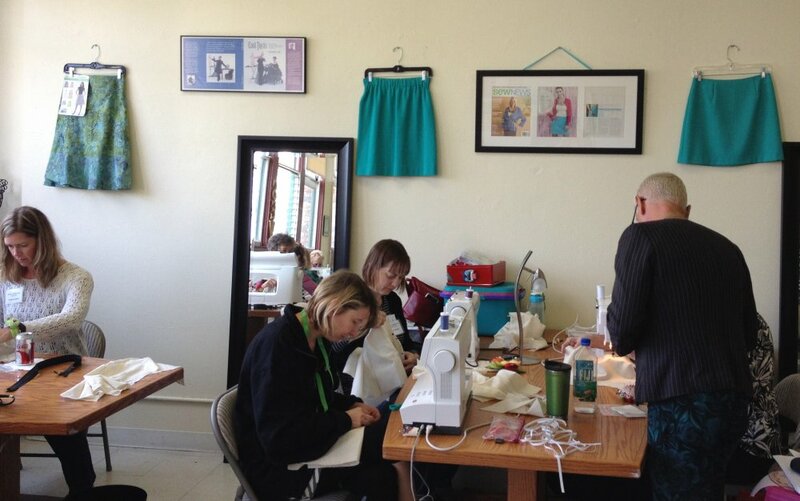 We really are fortunate to have your school in the local sewing community. Monday was amazing class. So much to remember and such good notes. You are amazing. My sincere thanks. You make everyone so comfortable and bring so many delightful aspects of making it happen for each one. I was so energized by my experience yesterday! I came away with confidence that I could proceed, and proceed with ease. I think that must be the mark of a truly great teacher—someone who empowers her student. 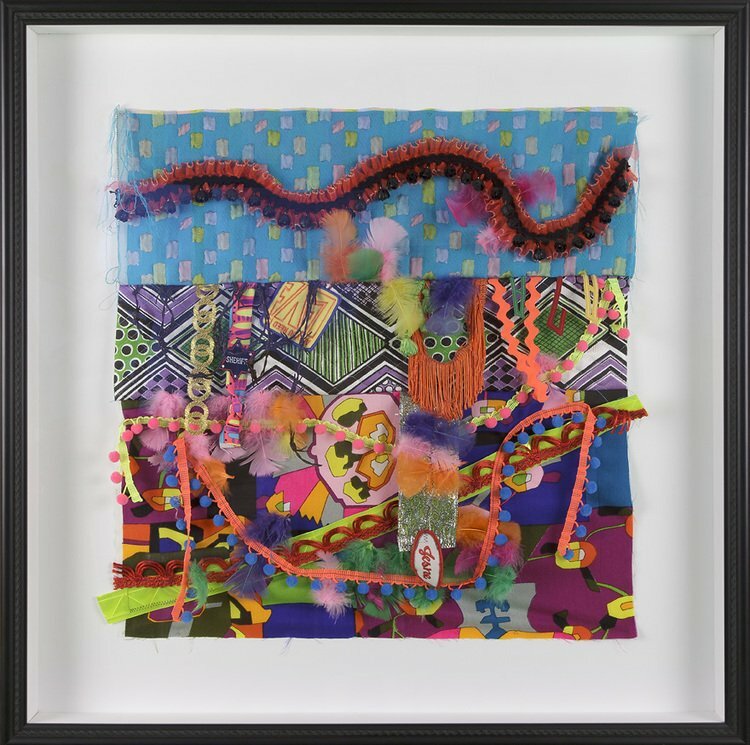 Ryliss - your class room is cheerful, thoughtfully set up for class room sewing. You allowed students in early to set up - as well as provided healthy, delicious lunches. Eating together on site allowed busy students a few moments to chat. Learning in your class room is a delight. Ryliss Bod is an unusual and gifted teacher, always having the time and patience for the best students and the most difficult ones. We never made errors in our work that couldn’t be corrected. Ms. Bod always showed us how, and she made it seem easy. Her classes historically had a wide range of skills amongst the students and she managed both ends with aplomb. Her message to us as a teacher never wavered, nor did its simplicity alter. There were ways to change our mistakes, and it was all part of the learning process. 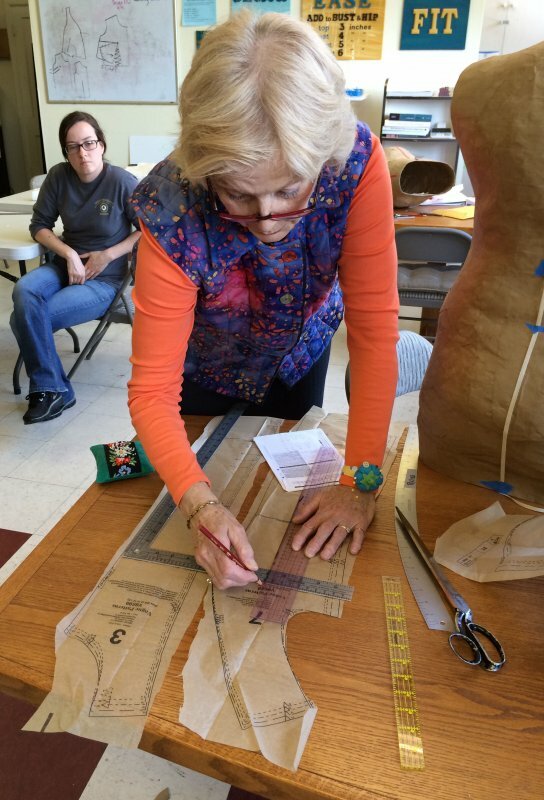 Making Patterns Fit before YOU SEW! Great job on the class yesterday, Ryliss! You even managed to keep Donna and me in line! I learned a lot--that is a new way of alteration for me and so much simpler. I know your school is going to be a big success. I’ve been a student of Ryliss Bod’s for 13 years. I consider her an excellent teacher and mentor. 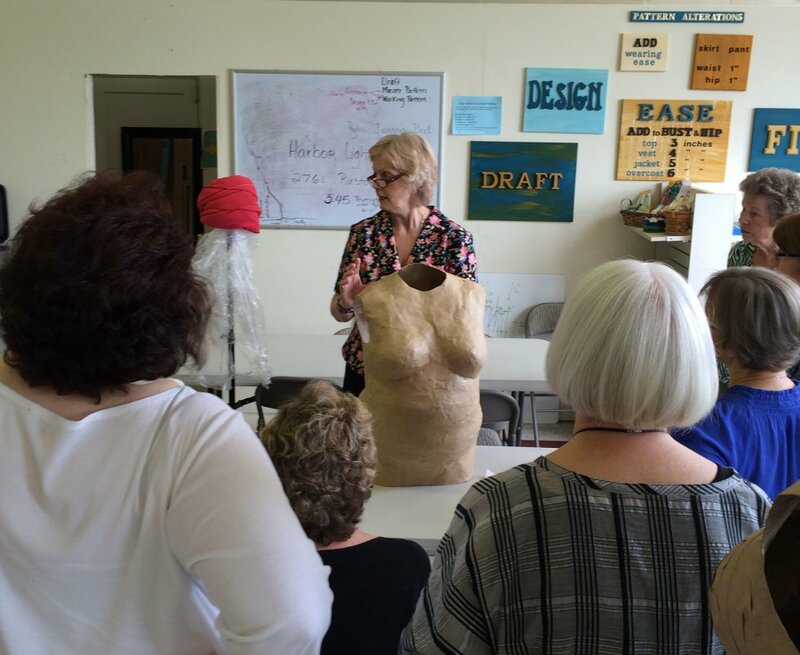 Whether you are a beginner, rusty because you haven’t sewn in years, or sew well but want to keep up with the latest methods and trends, Ryliss is the teacher for you. She is well educated in clothing construction and design and, as an artist, very inspiring to those of us who need that extra help with our projects. 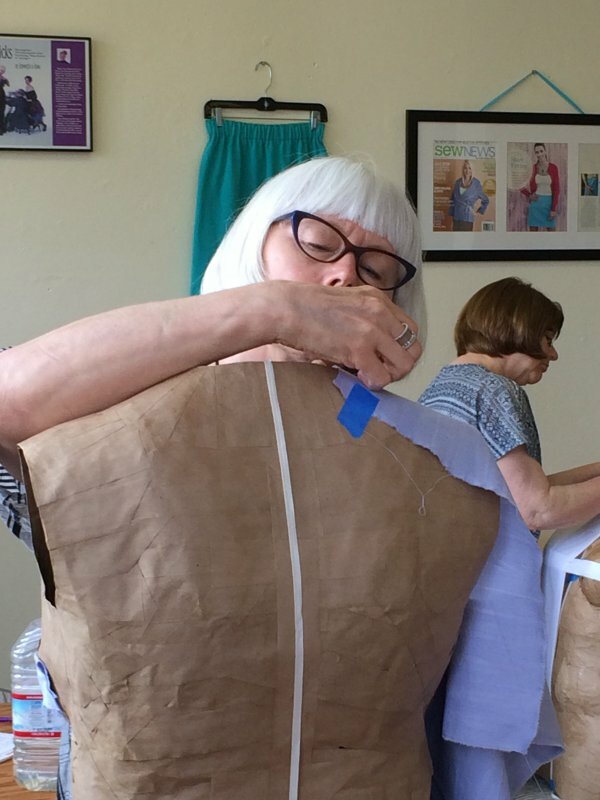 She also gives tips on making patterns fit before you sew, thus eliminating the frustration of deconstructing something on which you have put in time and effort. 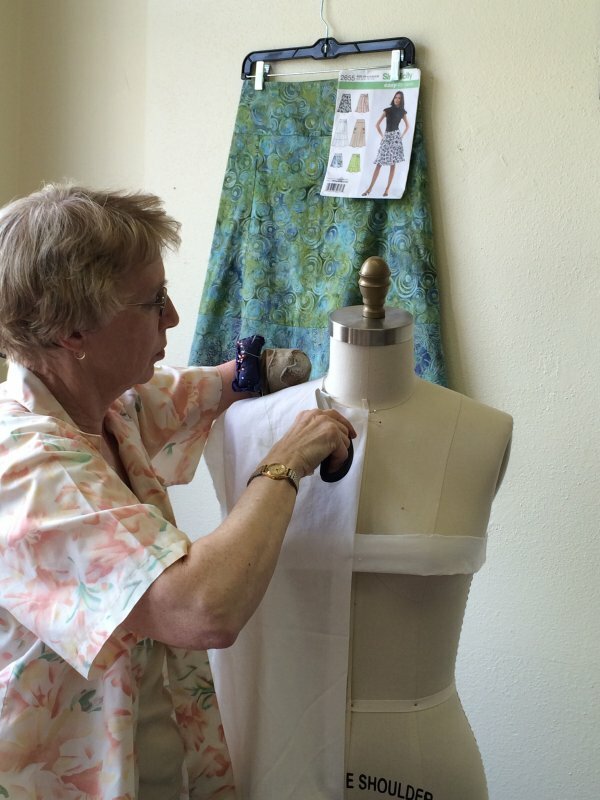 When her sewing course at Bates Technical College was eliminated last year due to budget cuts, Ryliss decided to open her own school in Tacoma, which has been in operation since September. I was delighted and signed up right away! 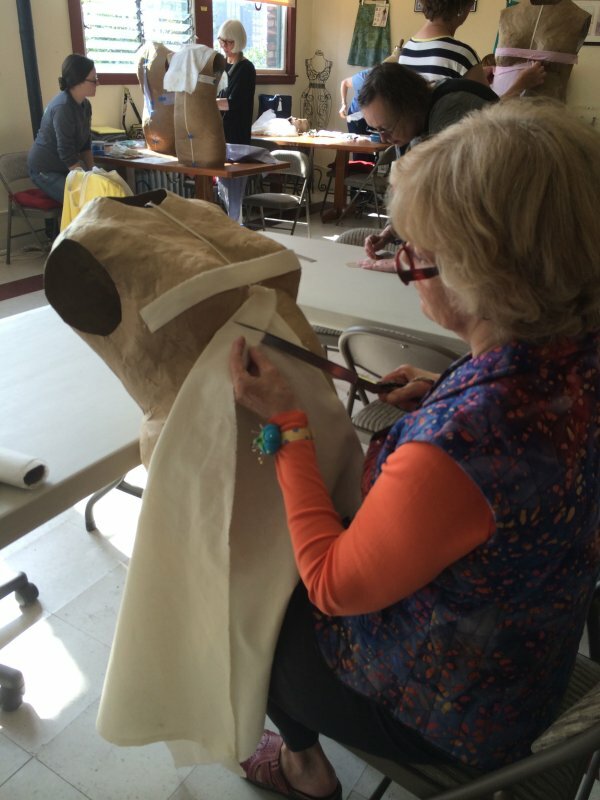 She offers a variety of classes, including open labs where you can sew garments, quilt or do craft projects. The sky is the limit. If you want an atmosphere that is conducive to learning and having fun while doing it, this school is the place for you. Work featured on MTV, HGTV, and many international publications including The London Times. Ryliss Bod needs to be acknowledged as a testament for her student’s successes. 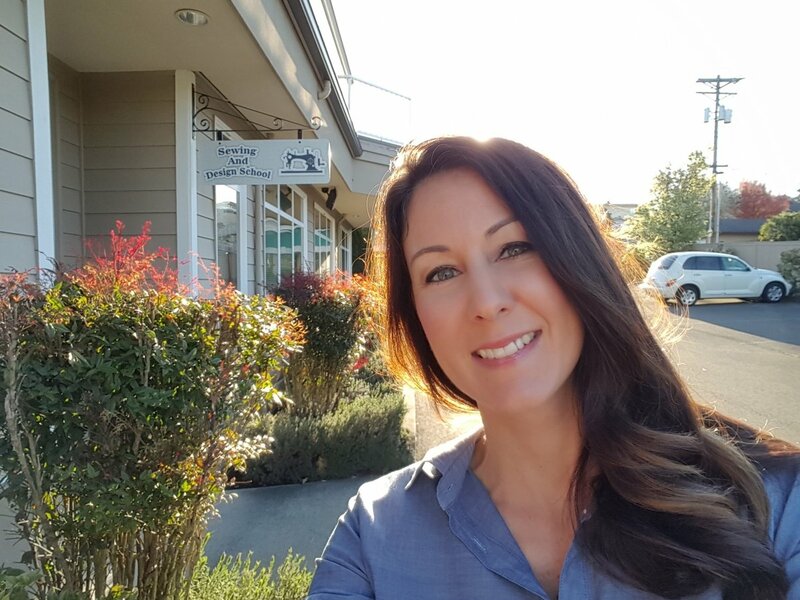 Besides her ability to passionately teach her field of expertise, she inspires her students to strive for the moon – for themselves – and not because of the expectation of a grade. A truly inspirational and gifted educator allows her students to bloom. 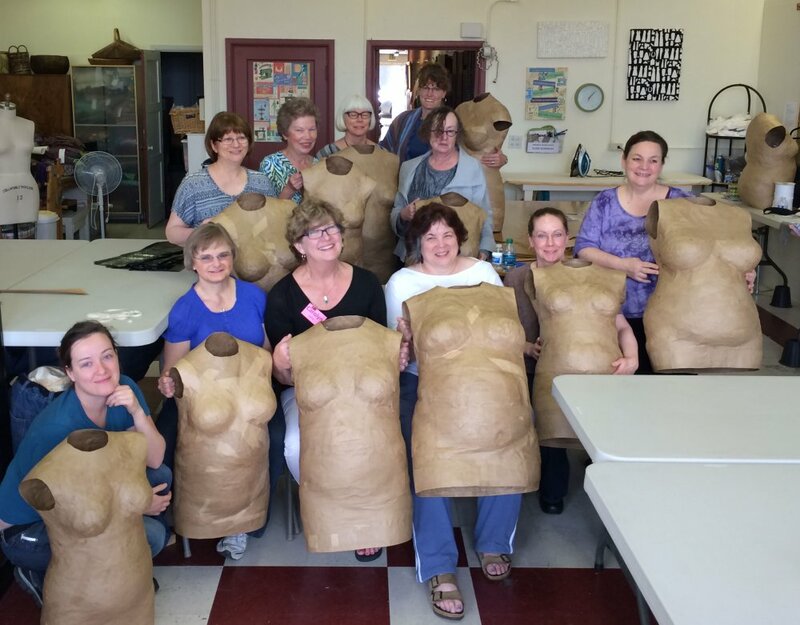 The curriculum offered by Ryliss Bod is excellent. Certainly, the basics of good clothing construction and home décor are taught. In addition, students can branch out from core instruction and apply what they’ve learned to their own projects. Through each student’s projects more teaching goes on. Ryliss encourages class participation by having the students share with one another what they are working on and the techniques used for their individual projects. This provides more collaborative instruction. 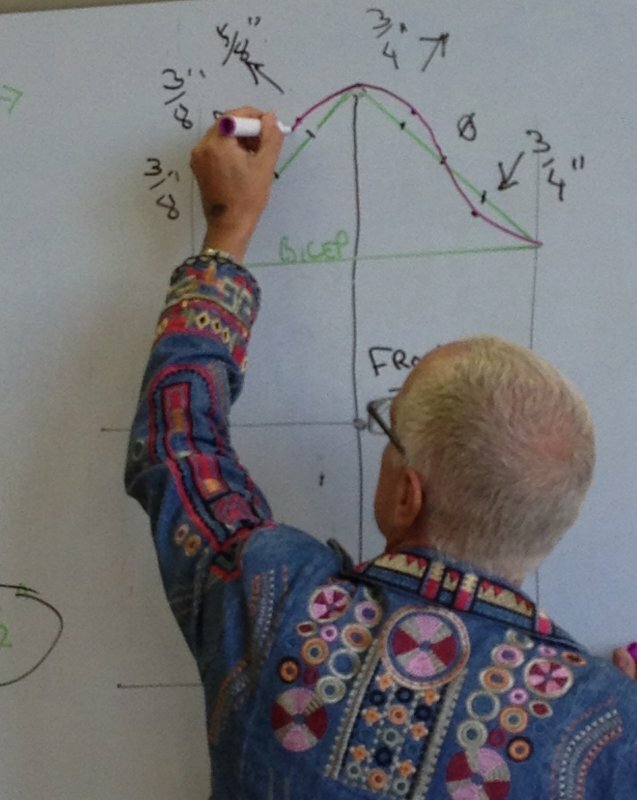 As a retired math teacher, I know that if a student leans a skill and then has to teach someone else that skill, it becomes more firmly cemented in that student’s mind. I have been in public education my entire life. 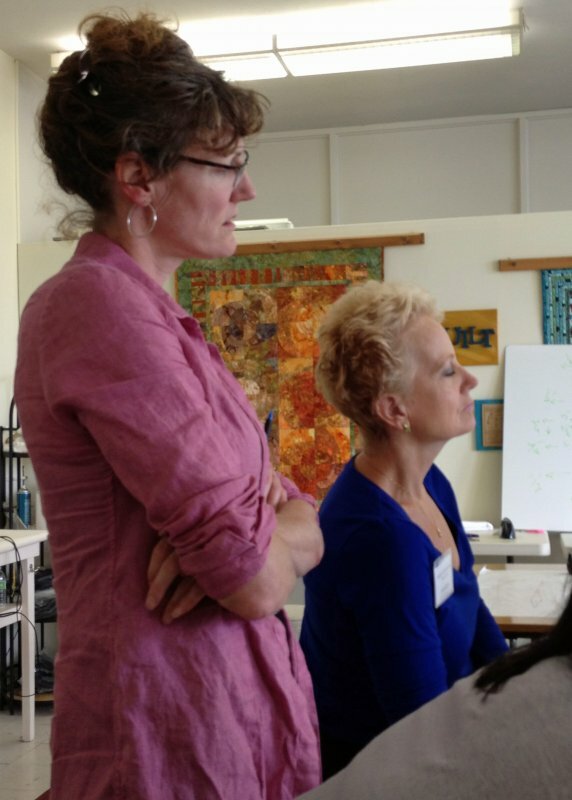 Over the years, part of my job has been to evaluate teachers in the classroom. Ryliss rates high on the scale of excellent classroom teachers. Her manner is very welcoming and inclusive, and students fell cared for regardless of their level of proficiency in clothing and home décor construction. 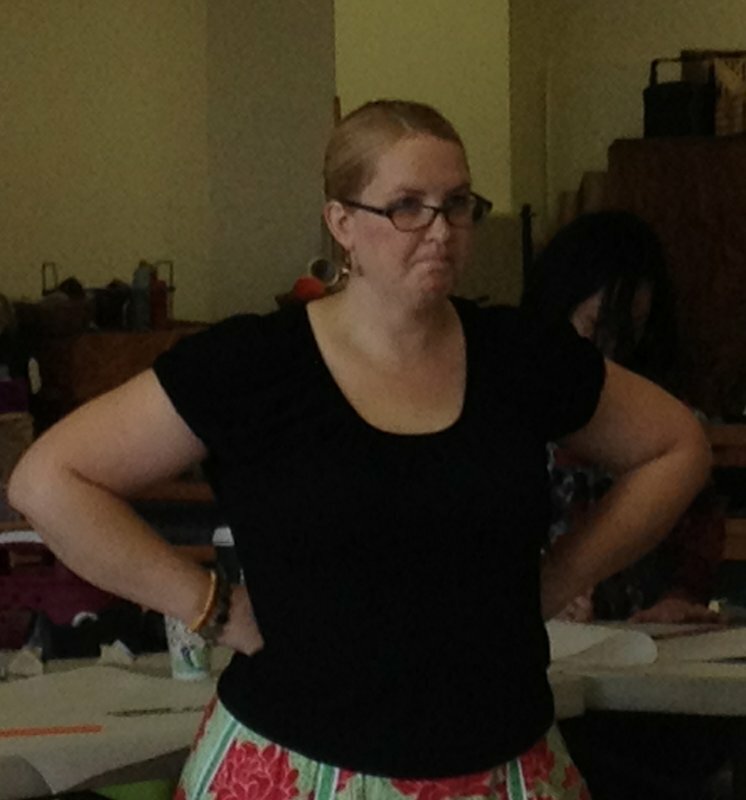 Ryliss does an excellent job with whole-class instruction on current methods of finishing garments and other projects. 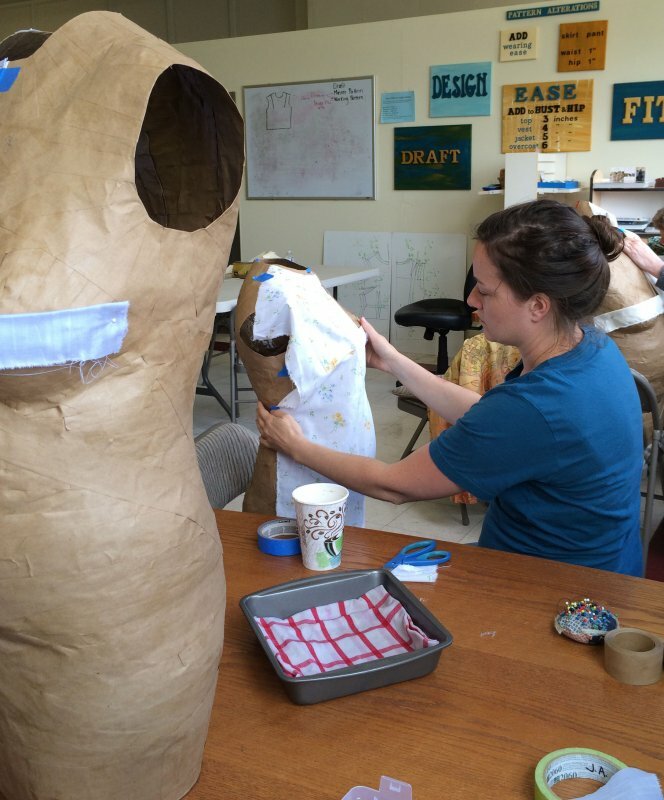 On personal individual projects, she personalizes the instruction to each student’s needs. 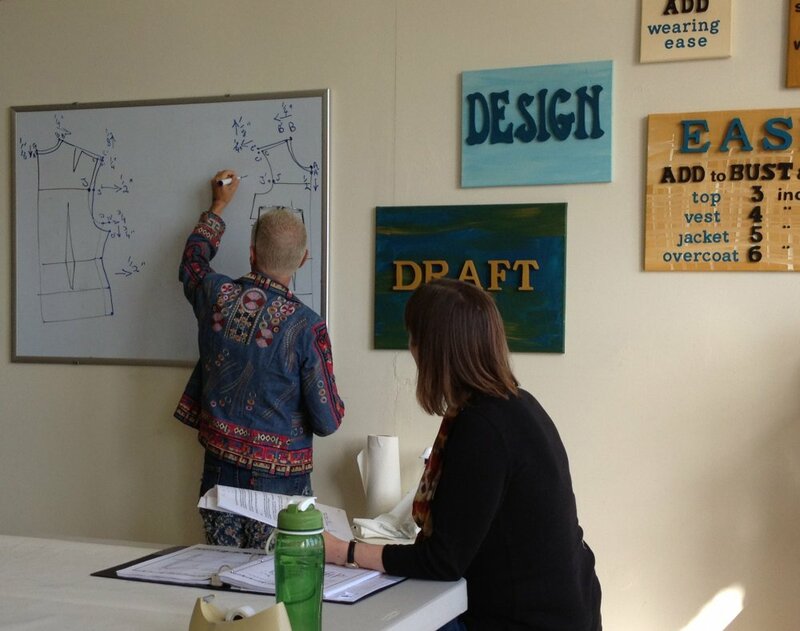 She always is looking for new opportunities to expose students to the latest trends and techniques while relying on a strong core of the basics. I give Kenneth an "A" for this one. He hit it out of the ball park again. Everytime he teaches Moulage, I learn more about the craft of drafting. I overheard students calling Kenneth a "Genius" and "Brilliant" along with being the best instructor in his field. He makes sure everyone keeps up with each step, and all of the students walk out with a well fitted moulage. Wow, notes from our class! You are a busy man, who flew home on a red-eye flight to teach another class. For you to recall, and then take action on this relatively small issue means a great deal to me (I'm sure I'm not the only one). The class was amazing; I came home with the information I'd hoped for, plus more. Thank you for making a tough subject accessible to us, and making it fun to learn. It was a joy to meet everyone, and to participate in learning about a subject that originated in Europe - a very long time ago. I can't wait to take another class. 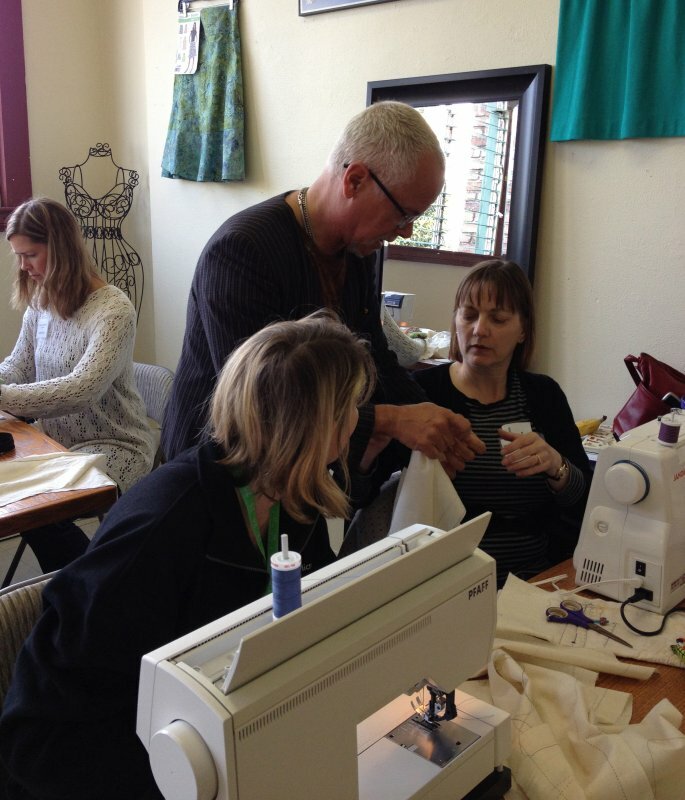 I recently saw Kenneth King at a sewing expo in Novi, Michigan, and was very impressed! 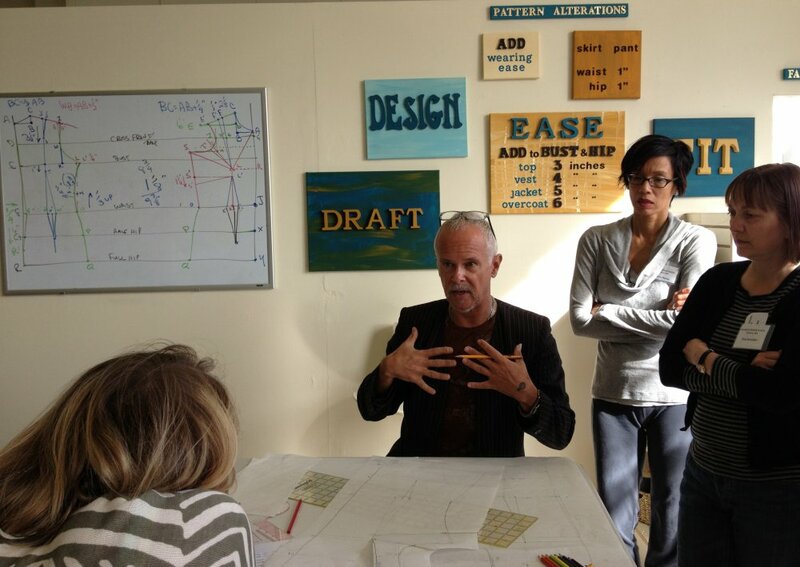 He is very knowledgeable, but at the same time is personable and funny! Anyone who wants to learn more about clothing construction and couture details would benefit from attending one of his events. 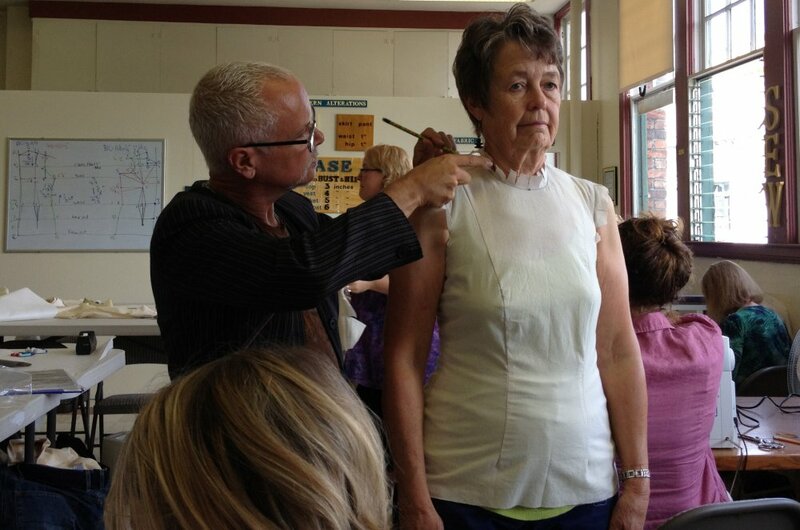 Kenneth explaining the process of using your moulage to create a princess seam sloper. 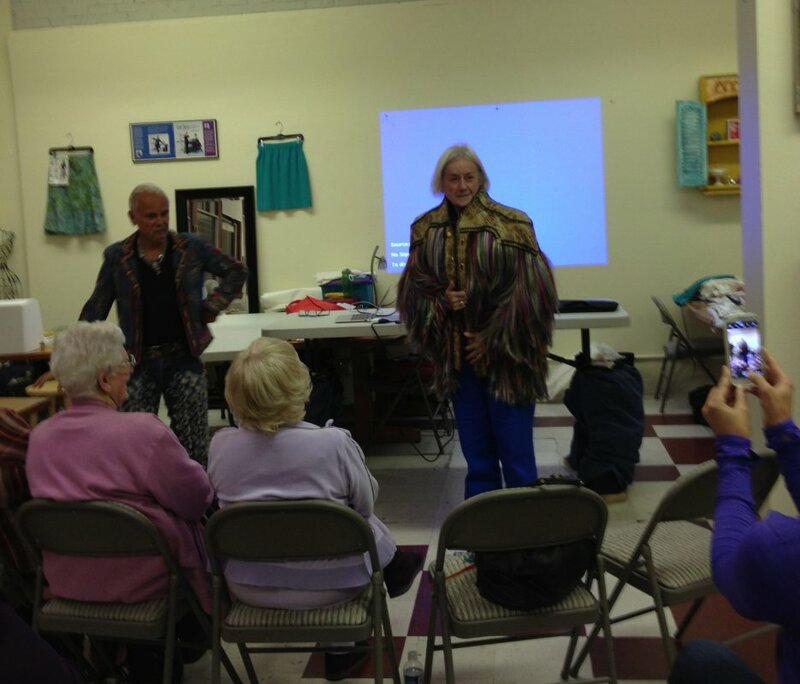 May 12-19, 2014 New York Fashion to Fabric Field Trip will visit Apryl and tour her home. Register under classes for this exciting trip. 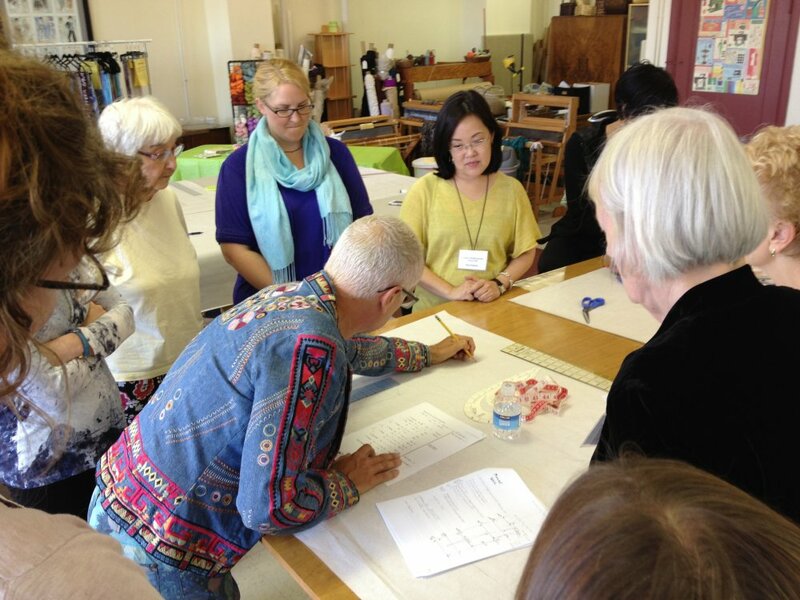 It's exciting to learn how to draft a custom fitted moulage and slopers. 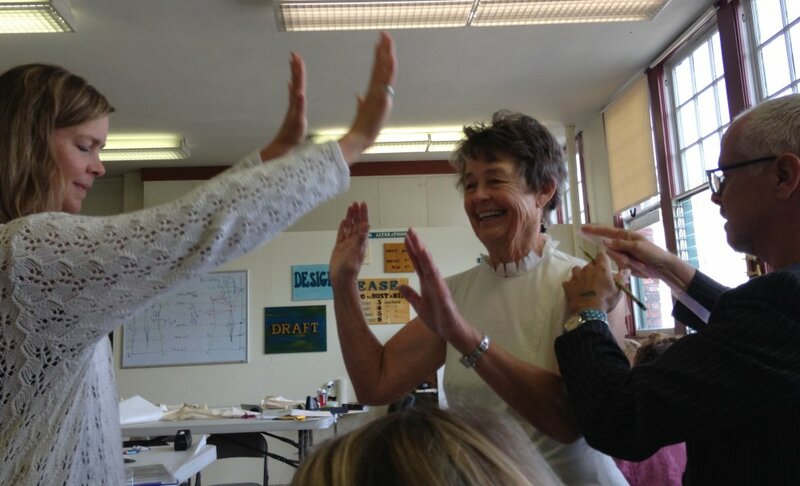 Daughter Stephanie from Texas and mother Emily from Idaho high fiving for a successful Moulage with Kenneth D. King. Kenneth showing the steps to draft the front of the moulage. Kenneth demonstrating creating the sleeve cap. Jane from Oregon is showing student's Kenneth's bag made from hair extensions. Kenneth showing Tina and Ekaterina construction steps. This only took a day and a half! Some of the dress forms and students are missing. They went on a long walk around the fun neighborhood in Opera Alley and Broadway. Leah is happy with her moulage. 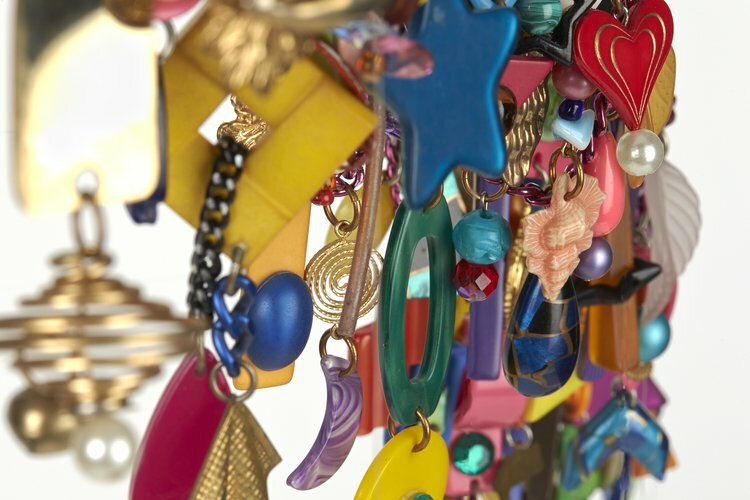 You may place your dress form on a stand, hang from a door or a hanger. The shoes came off. It was time for Rae to relax and have fun. Gwen wants to be shown proof this works. Rosanne came up from California for this Moulage class. 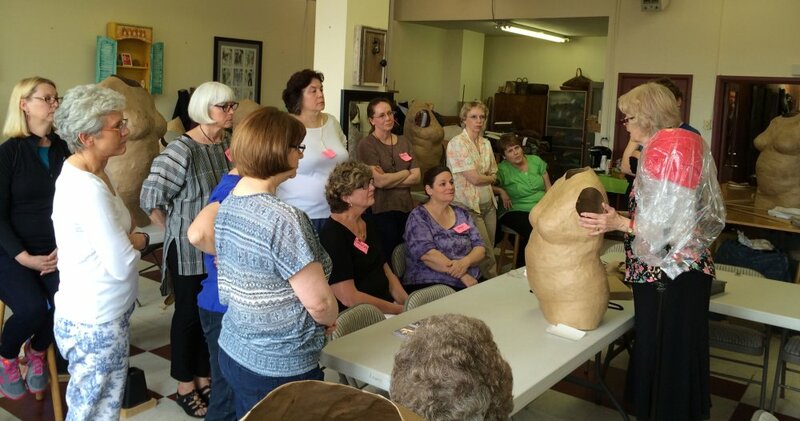 There were students from Texas to Alaska, 5 different states were represented in this class. Jane from Oregon wanted to try on Kenneth's "Hair of the Dog" coat. The bodies dry overnight after the first day. They will harden enough to drape on but soft enough that you will be able to stick your pins into them. 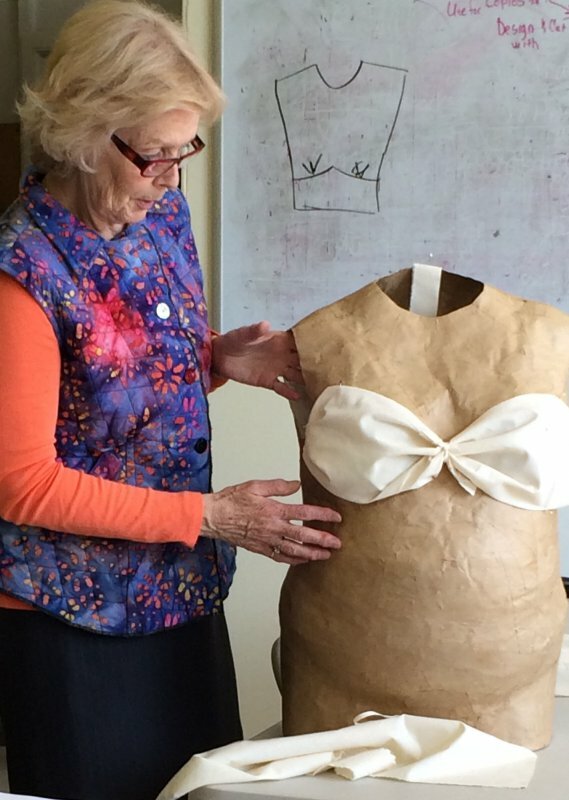 Diana starts by smoothing the muslin on her front bodice drape. 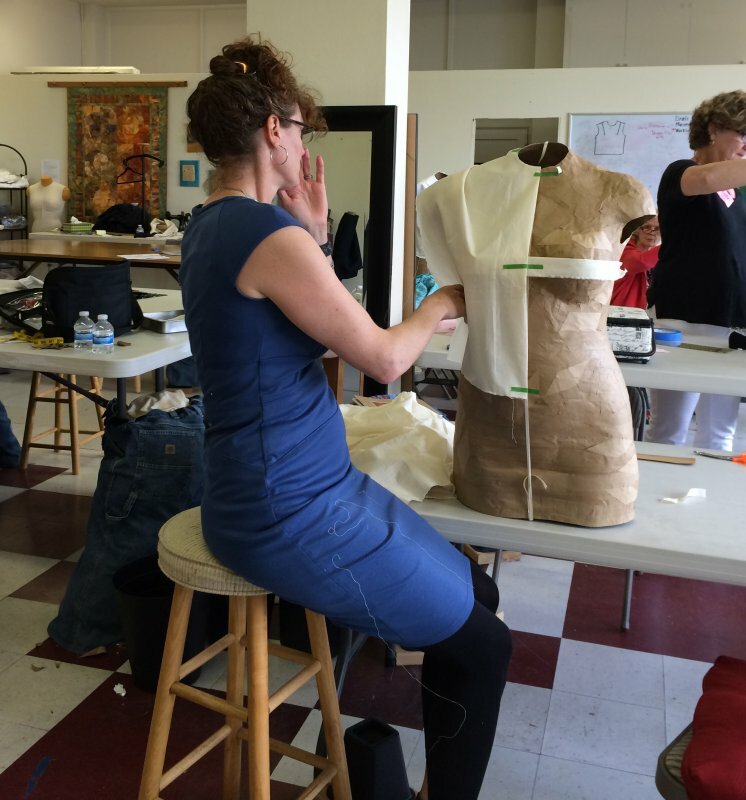 Katy is draping on a commercial dress form. Julie is pinning in ease. 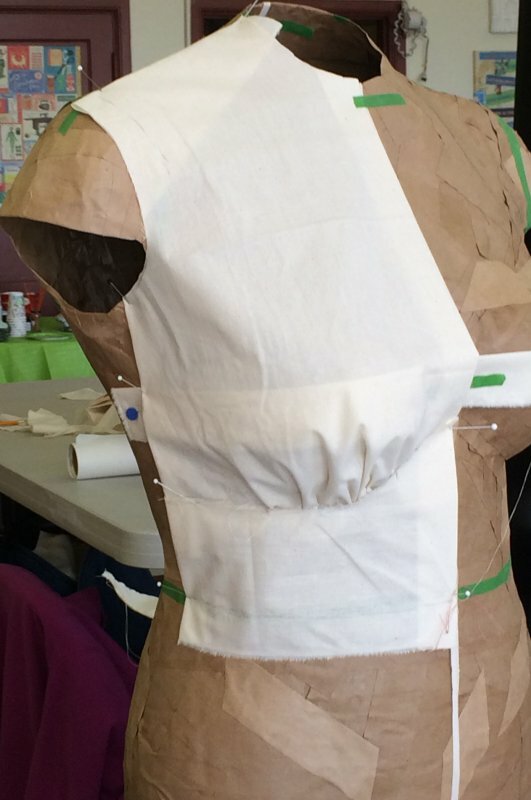 An exercise in draping a bandeau. Watch out Maui, here I come. All are busy following Jan's instructions. Flat pattern alterations may be made using your dress form for fit. The dress forms have 2 inches of ease built in.